Compact desktop DAC and headphone amplifier with dual mono design, onboard DAC (USB, coaxial and optical inputs) and optional upsampling to 192kHz. 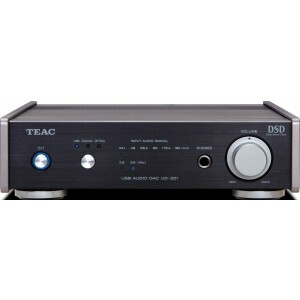 - Dimensions (WHD): 8.5" x 2.4" x 9.4"
TEAC UD-301 is a compact DAC with a dedicated headphone amplifier and pre amp, providing high-performance audio from a compact desktop unit. Compatible with DSD native playback converting 5.6MHz files directly into analogue signals, the DAC incorporates asynchronous transmission to control timing of the input signal using the internal clock. The TEAC UD 301 showcases a dual monaural circuit design. Each of the two internal BurrBrown 1795 DACs work on a single channel to stop mutual interference between the left and right channels in order to ensure unblemished stereo playback. The model is capable of 32-bit processing, which ensures superb and reliable playback of high-res sound sources. Digital audio signals are transmitted in an immaculate state as jitters have been removed. You are able to double the original sampling frequency signal up to four times when dealing with digital signals of up to 96kHz. You can switch in or out as your preference dictates. A high-efficiency toroidal core power transformer guarantees the smooth operation of the twin D/A converters. By utilising a low magnetic flux leakage, you can be sure of a stable power supply even in situations that need an abrupt surge of power. The electrical current output is transformed into a voltage signal by the MUSE operational amplifier. The headphone amplifiers in the CCLC circuits showcase a dual monaural design and get rid of the negative influence of capacitors on sound quality for full-bodied low-frequency sound and an intuitive headphone listening environment with brilliant spatial awareness. The power supply is cut and circuits isolated from the output in order to enhance the performance of the headphone output. As a result, the headphone amplifier is simplified with volume control being separated from the output mode on the rear panel. The model comes with RCA and XLR balanced outputs that allow you to connect the unit to your household hi-fi models along with professional-grade audio items. Alongside this, the outputs on the rear panel can both be set adjustable, off or fixed. More compact than the 501 series, the TEAC UD 301 features a shrunk casework to allow greater positioning flexibility. The solid enclosure and metal chassis provide fantastic vibration control and a sleek look.